MINNEAPOLIS (PAI/Workday Minnesota) — After decades of displacement, war and poverty, workers in Colombia face the possibility of a better life – but only if protections in the year-old Colombia-U.S. free trade agreement are enforced, a top Colombian unionist says. 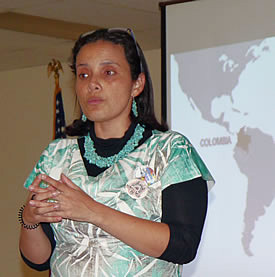 Sohely Rua Castañeda, Secretary of Women and Labor at the National Union School in Colombia, brought that message to Minnesotans on April 29, speaking to a gathering at the Communications Workers Local 7200 hall in Minneapolis and the Minnesota Union Women’s Retreat in Brainerd, among other venues. “We are at a very unique moment of time in Colombia,” Rua Castañeda said in her Minnesota talk. 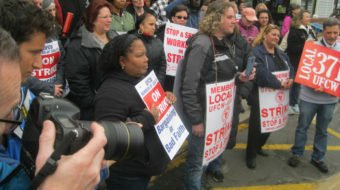 She credited solidarity from workers in the U.S. with forcing trade negotiators to include minimum labor standards in the trade agreement that took effect May 12, 2012. “For the first time in 30 years, we can talk about labor issues again,” she said. 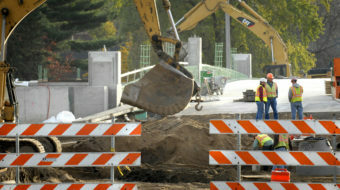 But it remains to be seen whether the labor protections will be enforced and be long-lasting. Colombia remains the most dangerous country in the world to be a union activist. A Colombian Senate committee, headed by a pro-labor lawmaker, held a hearing there on workers’ rights and enforcement, on April 29. In 2012 alone, 20 trade unionists were killed and more than 430 received threats on their lives, Rua Castañeda said. “We think there needs to be more pres-sure” on the Colombian government, she added. Some 95% of the almost 3,000 murders of Colombian trade unionists in the past 20 years are unsolved, records show. To that end, she has been meeting with union leaders and elected officials while in the U.S., including Rep. Keith Ellison, D-Minn., a member of the Congressional Monitoring Group on Labor Rights in Colombia. 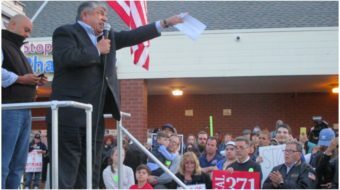 Recently, Ellison and other lawmakers wrote an open letter to colleagues expressing concern about conditions in Colombia. Attacks on their rights are not the only issues facing Colombian workers. The free trade agreement has given transnational corporations more opportunity to implement an agenda that includes creating more temporary jobs, increasing outsourcing and driving down living standards for the majority of the population. Colombia’s vast resources, including water, coal and oil draw multinational companies such as Coca Cola, Chiquita, Dole and Drummond Coal. “Colombia is a land with a lot of resources, yet the population lives in poverty,” said Rua Castañeda. Transnational corporations, aided by the Colombian government, seek to exert control over resources and force people off the land. Colombia is currently the country with the largest internally displaced population in the world – more than 5.2 million people, according to Witness for Peace, an organization working for peace, justice, and sustainable economies in Colombia and other Latin American countries. U.S. workers can learn from Colombians as they organize to stop these attacks, and have another reason to care: U.S. tax dollars help advance the corporate agenda. The U.S. government, through its “Plan Colombia” program, has sent billions of dollars to the Colombian government with the goal of reducing cocaine production and bringing stability to a country that has endured 60 years of civil war. More than $300 million was sent last year alone. “Instead, U.S. aid has made an already dire situation even more precarious,” according to Witness for Peace. Some of the money has ended up in the hands of right-wing paramilitary groups involved in killing union leaders.